The Monoprice Select Series 10,000mAh may be slightly bigger and heavier than the competition, but the pack's incredibly low price makes it the clear winner. How many times have you had that sinking feeling that your smartphone or tablet battery is just about dead right when you need it to be charged and ready? There is absolutely no need to fight for the only available AC jack in the waiting room, airport gate seating area, commuter train or anywhere else. 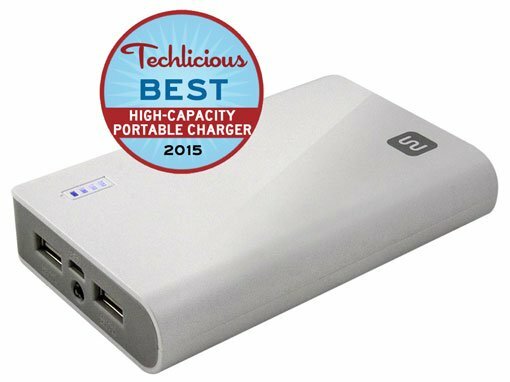 All you need is a potent yet portable battery charger to avoid the AC outlet scrum altogether. But which portable battery is best for you? If you're both a smartphone and tablet toter, or you spend long periods of time away from power jacks, a battery charger packing at least 10,000 milliampere-hours (mAh) is the way to go. With most smartphone batteries ranging between 1,440-3,300mAh, you’ll get at least 3-4 full charges. And you’ll get 1-2 full charges on your tablet, with batteries typically in the 4,000 to 12,000mAh range. 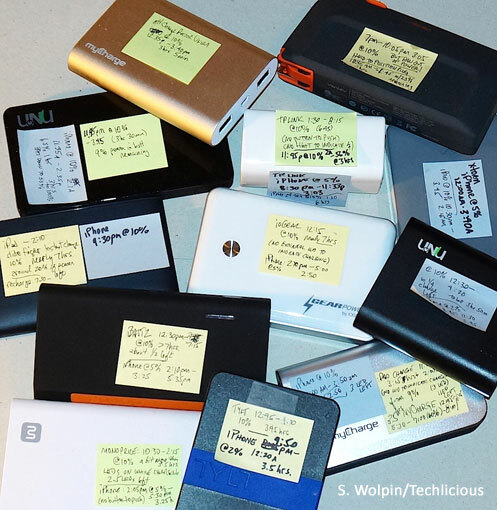 With so many portable chargers on the market, finding the best can be a challenge. I found a dozen that met our capacity criteria, had a strong feature set and were from brands renowned for producing high-quality chargers. And, over the last few months, I ran them through their charging and recharging paces. I also considered each one’s size and weight, if cables were included, the number of charging jacks, charging jack power outputs, included extras and price to determine which was truly the best. In the end, the Monoprice Select Series came out on top. It didn’t outright win any categories, but it held its own in the front-running group and came in at a ridiculously low price of $19.99. The other top candidates – such as the MyCharge HubUltra, Tylt Energi 10K and uNu Superpaks – ran anywhere from $99.99 to $149.99. Yes, some of them offered slightly better performance or features than the Monoprice. But $80+ worth of features? I don’t think so. Most 10,000mAh portable batteries include two USB power output jacks: one outputting 1 amp for recharging mobile phones and one putting out 2.1 amps for tablets. Each of these multijack packs is designed to recharge multiple devices simultaneously (Consult the chart below to see the varying jack/output combinations). Caveat emptor — let the buyer beware — when it comes to advertising claims that more amps equals faster charging. Charging your smartphone using a 2.1-amp or 3-amp jack will not result in faster charging; the phone can only draw 1 amp of power. However, using a 1-amp jack to recharge your tablet will slow the process down considerably. All the packs are equipped with indicators that show remaining power, usually with four or five LED lights. The Ventev and the uNu Ultrapak Tour display the precise remaining power percentage on small built-in screens – nice, but not critical. Battery packs vary more widely when it comes to battery pack capacities, plugs, extras and price. Some packs such as the myCharge Hub and the Ventev Powercell 10000+ have built-in micro-USB and Apple Lightning cables, keeping the pack compact and eliminating the need to carry extra cables. The Ventev’s built-in AC prongs allow you to recharge it simply by plugging it into an AC wall socket. The myCharge Hub comes with an AC wall coupler for wall outlet recharging, or charge via micro-USB cord, which is how the other power packs regain their potency. A few packs had added conveniences and niceties. Both the Monoprice and the TP-Link 10400 Power Bank include a little LED flashlight, and the uNu Superpak comes bundled with a separate dual micro-USB/Lightning cable. As far as physical size, we viewed weight as more important than size. Most of the portable charges weighed in around 10 ounces, give or take an ounce. The Lepow Poki was the lightest at 7.36 oz and the MyCharge RazorUltra was by far the heaviest at a whopping 21.12 oz. Too heavy, in my opinion, to consider as an option. Our battery testing took considerable patience. I discharged an iPhone 6 Plus and an iPad Air down to 10 and 5 percent, respectively, by running continuous video; a process that took about 10 hours each, Then I recharged the devices, running multiple tests using each portable battery to double-check initial results. Phones and tablets don't "ping!" when they're done recharging so I literally had to watch them every second as they were getting close to full..
As a group, the packs charged an iPhone 6 Plus in 2 hours and 45 minutes to 3 hours and 45 minutes hours. By comparison, a modern smartphone usually takes about three hours to recharge via a wired AC connection. The MyCharge RazorUltra clocked the fastest recharge time, with the uNu Superpak SP-14-1000B bringing up the rear. The Monoprice Select Series was in the middle at 3 hours 25 minutes. Obviously, faster is better. However, I would say all the times were close enough to keep everyone in the race. Bigger differences arose recharging an iPad. The ioGear GearPower, TP-LINK 10400, the Lepow Poki and the iBattz BattStation 20400 chargers all took between six and seven hours to recharge an iPad. Even considering the low price and weight of the first two, those results took these models out of contention. All the packs took between seven and 11 hours to recharge. Battery packs with higher capacities had longer recharge times. You can compare the results for each model in the chart. Looking purely at features and test results, the MyCharge HubUltra and Ventev Powercell 10000+ are the clear front runners. They charge faster than any other charger (except the HubUltra’s overweight brother, the RazorUltra), have integrated cables for convenience and to reduce clutter, and even built-in wall chargers, making it a breeze to recharge anywhere. The Ventiv also offers a USB jack for charging a third device, though weighs in four ounces heavier. But the prices make me shudder. $150 for the HubUltra is an awful lot to drop on a portable charger. And the Ventiv at $70 on Amazon is still a big chunk of change. By contrast, the Monoprice Select Series offered performance close to that of the MyCharge and Ventiv, in a slightly smaller package and, here’s the clincher, for only $19.99. You could buy seven Select Series for the price of one HubUltra! Nothing else that remained in contention came even close to this price point. And, if you’re looking for even more recharging power, Monoprice has a 16,000mAh Select Series model for only $24.99. The Monoprice Select Series will also perform just as well for you in the real world as it did in my testing. The Select Series receives 4.6 out of 5 stars from Amazon reviewers among 78 reviewers, with no reviews below three stars. So, when considered as a package the Monoprice Select Series Powerbank gets my pick for the all-around Best High-Capacity Portable Charger.